The aerobic capacity measures how long and at which level an athlete can perform with a sufficient oxygen supply in his blood. The decisive variables are the functionality of heart and lungs, the oxygen transport capacity of blood, and the amount of enzymes of the aerobic metabolism (located in the mitochondria) in the muscle cells. The aerobic capacity is the basis of an athlete’s performance level. 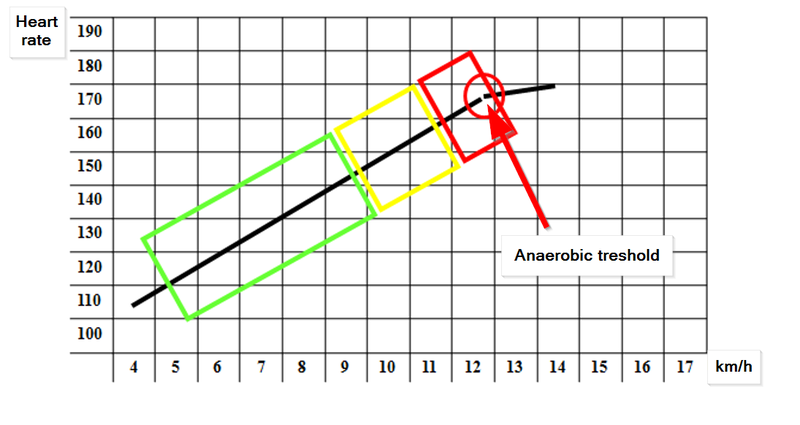 The anaerobic capacity measures the ability of an organism to perform when lacking oxygen. The typical situation for this is a short, high-intensity effort like a 400 or 800-meter run, rowing, or running up the stairs several levels in every day life. For a long-distance runner, the anaerobic capacity is barely important unless during a race he faces uphills or increased speed. The enzymes of the anaerobic metabolism are located in the cytoplasma of cells. Whether you run, ride your bike, or swim doesn’t make a difference to our heart. Therefore, a run can easily be substituted by an alternative training. We propose the length required in the possible alternative endurance sports for each training session to get the same stimulus. Generally speaking, however, you should try to keep the key workouts a running workout (long run, medium pace, and interval). Excellent but technically very demanding mix of water gymnastics and running in a swimming pool. A neoprene buoyancy aid is required that allows and supports a proper upright position. Our breathing works autonomously which means it speeds up when your running pace and the need for oxygen increase and vice versa. Breathing exercises at rest are strongly recommended. They help relax and finding yourself. Practical tool to loosen your muscle fascia. A must for all runners. Order now in the store. 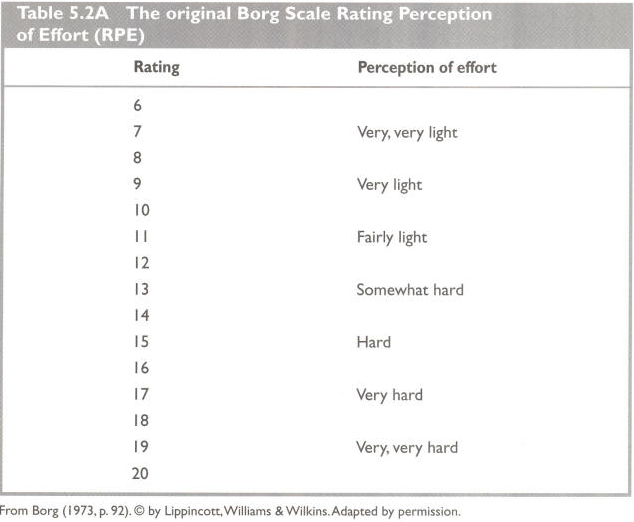 In order to measure perceived exertion, the Borg Rating of Perceived Exertion (RPE) Scale is used, named after the Swedish physiologist Gunnar Borg. It is based on the heart rate during a workout as follows: heart rate x 0.1 = RPE. A proband tells his perceived exertion during an ergometry, light (10) at a heart rate of e.g. 100 and very hard (17) at a heart rate of 170/min. The basic endurance is the prerequisite for improving your performance. Running isn’t the only way of training it; it can be built by all endurance sports. The heart doesn’t differentiate whether it is trained by bike riding, cross-country skiing, or swimming. Running with functional clothing is twice the fun. Try it out and get to know the benefits of several sports fibers. No matter whether it is cold, warm, humid, dry, or wet. By the way, when it comes to sports, the days of cotton are over. It soaks the sweat and makes you feel cold. Make sure you feel a little cold when you start running. After maximum 10 minutes when you are warm you will feel appropriately comfortable. Take a look at our table. This lets you put on the right apparel in any weather. Important last part of a hard workout. The harder the workout, the longer should be the cool-down. The goal is to start the recovery process. A cool-down is important and makes sense after a race, too. The capillarization describes the blood supply situation in the muscle or other tissues. Capillaries are very small blood vessels in the body. The heart pumps fresh, oxygenated blood into the aorta that divides into smaller and smaller vessels on the way into the organs and tissue structures, i.e. the structure goes from the aorta into different arteries, arterioles, and tiny capillaries. The capillaries can be found within the tissue and are extremely branched. Our muscles, too, are criss-crossed by a very fine capillary network. This is where the exchange of oxygen takes place as blood that is freshly pumped by the heart brings oxygen to the muscles so that they can continue to work. If there isn’t enough oxygen, the muscle gets "sour" and can no longer work. The bigger the total surface of the small capillaries, the bigger the exchange surface and thus the better the supply of the muscle. In technical terms, this is called capillarization, i.e. the ratio of the capillary surface to the supplied tissue. Regular aerobic training improves the muscle capillarization. This means that regular and long runs, jogs, skating, or swimming lead to an increase of the exchange surface in the muscle after some time. Muscle with a better blood supply can work more efficiently and longer. That is one of the reasons why I increase my performance level. Because my muscles get more oxygen and, therefore, can "persevere" longer. 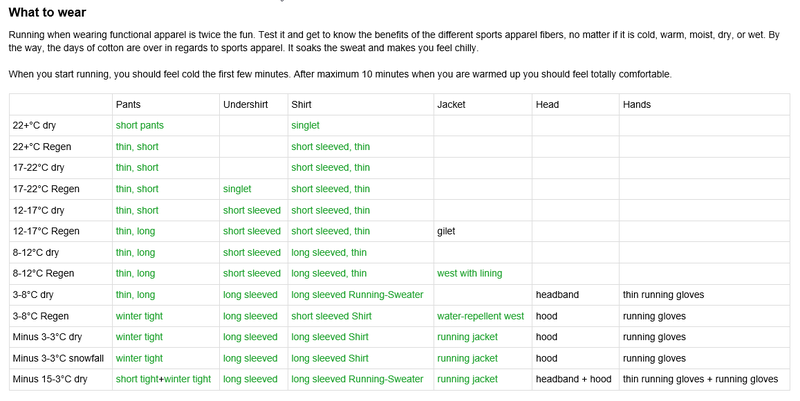 Textiles that are useful before, during, and after a training session. Their goal is to increase the venous backflow and reduce vibration forces. Order now in the Shop. - Playing with speed: change the pace every 30 meters. For example, "medium - fast - medium - very fast"
- Playing with stride: run at a medium pace and two different step lengths or cadences, respectively. For example, alternating 20 meters short steps, high cadence and 20 meters long strides, low cadence. - Strides: continuously increase your speed but only as long as you can keep the movement under control. Another ideal alternative sport with no eccentric stress for runners. Technically comparatively easy, a regular training on the bike is worthwhile especially for runners who do mountain runs or train for a marathon. We tell you how long you would have to ride for an equal stimulus. We make a forecast for your competitions. Our experience shows that it is very precise if your information in the settings is true. The forecast takes your performance level, the remaining preparation time, the priority, and the elevation change of the competition into account. Based on your values the program calculates a realistic goal. You cannot enter a desired time because this would cause certain runners who completely overestimate themselves to train to intensely and in the worst case get injured. In any case, the program tries to lead you to the best possible result. 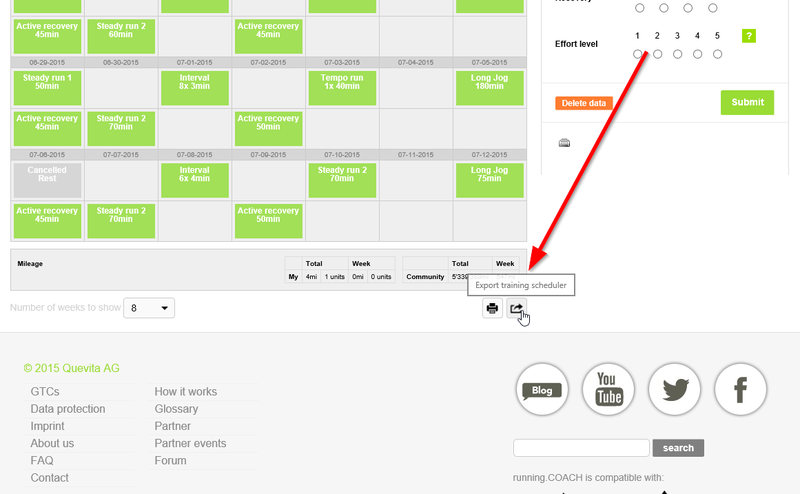 Copy your training schedule to your calendar with two clicks (outlook, iCal, etc.). Click here for more information. Usually, running upwards at a constant intensity slows our running speed whereas running downwards accelerates it. We have to take these facts into account both in training and competition. This means the speed is a relative measure once elevation change has to be overcome. Our GAP function shows you how fast you would have run had there been no elevation change. By the way: running.COACH generates a mountain run training schedule if your main competition exceeds a certain elevation change.nerv (Parasympathikus) Platz einzuräumen für lang anhaltende Ausgeglichenheit und stabile Gesundheit. Our body is wrapped by some kind of wrapping material that lies beneath the skin, similar to a sausage wrapped by a skin. The fascias are a fibery web of connective tissue that is between 0.3 and 3 millimeter thick, connects everything, and keeps everything together. Whether the upper arm is firm or looks like a pudding mainly depends on the tone of this wrapping. These fascias can clog and harden. This causes diffuse pain that can be relieved with the blackroll. More than one piece of the puzzle. The feet are part of our capital and they want you to take good care of them. Get yourself used to doing exercises for your foot muscles every week because without these exercises they will feel like flat tires especially on a long run. Click here for the list of exercises. Competitions can be prioritized in the settings. The preparation and follow-up of the competition are set accordingly. In case of a fun competition little consideration is given to the race because it is assumed that the ambitions are moderate. The competition is treated more like a training. The acronym GAP stands for the theoretical pace that you would have run if your training course had been completely flat. This function serves as a retrospective indication that tells you how well you matched the target pace in hilly/mountain runs. Liquid energy supply you should take during a race that lasts longer than 1 hour. It is also recommended to eat it in a training session, right after the last effort and before the cool-down. You have the possibility to select the ground when logging your training and get the statistics. When preparing for a major competition, you should take the ground into account. Somebody who trains for a track race should do the intervals on the track. Somebody who does a city marathon should do as many kilometers on paved roads as possible. 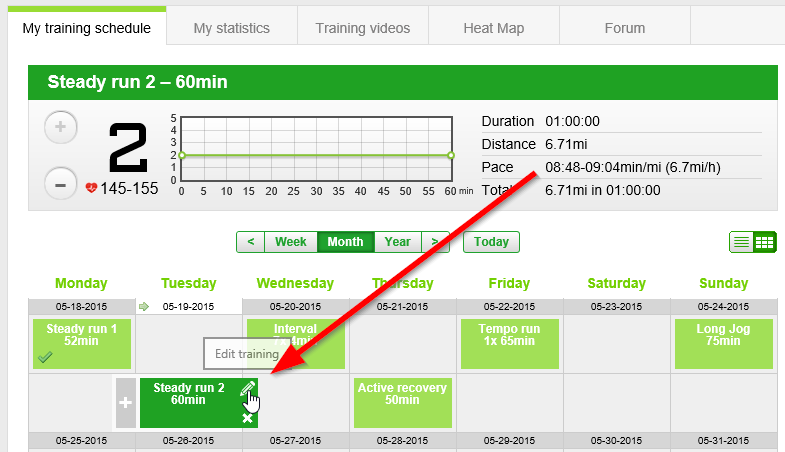 When you upload your running courses to your training protocol, we show them on the Heat Map. A few clicks let you see where in particular you run. Click here for the Heat Map. The heart rate is a useful measure to determine the intensity. It is measured at the chest. The heart rate is individual and varies: a runner who trains a lot and on a regular basis has lower values for the same performance. Furthermore, the rest rate will decrease. On the other hand, the maximum heart rate does not change or only at an increased age. The maximum and rest rate can directly be edited in the header. - Don’t be a slave to the heart rate monitor! Try to develop the feeling of your body. - Rules of thumb like 220 minus age are very inaccurate. Gender, body frame, and vegetative factors have an effect on the maximum heart rate. As a consequence, persons of the same age may have a different maximum heart rate. - When running uphill, the heart rate is higher compared to running on flat ground. The difference depends on running technique. The same is true for alternative sports. Note, however, the fact that more often than not, you don’t have to support the body weight in other sports. Therefore, the average heart rate is 10 beats lower when riding the bike. - The heart rate reacts to vegetative factors. If you are nervous, your heart rate goes up. Therefore, it is no surprise when at the start of a race your heart rate is already way high. Hill sprints let you strengthen the running-specific muscles. The efforts are between 8 and 12 seconds and require a break of at least 90-120 seconds. Hiking is a gentle alternative to running. It is very suitable as preparation for long mountain runs or during the training break to build up the basic endurance. An ice bath after a run causes your blood vessels to tighten because of the sudden cold and minimizes the blood circulation in the muscle. After the ice shock, the vessels expand and the blood circulation is stimulated. This helps removing waste products and reducing inflammation reactions caused by micro injuries of the tissue. Alternative form of training on rollers. Technically demanding and with a risk of danger due to the long braking distance. The training can be divided in different intensities which can be pace, heart rate, or the subjective intensity level. 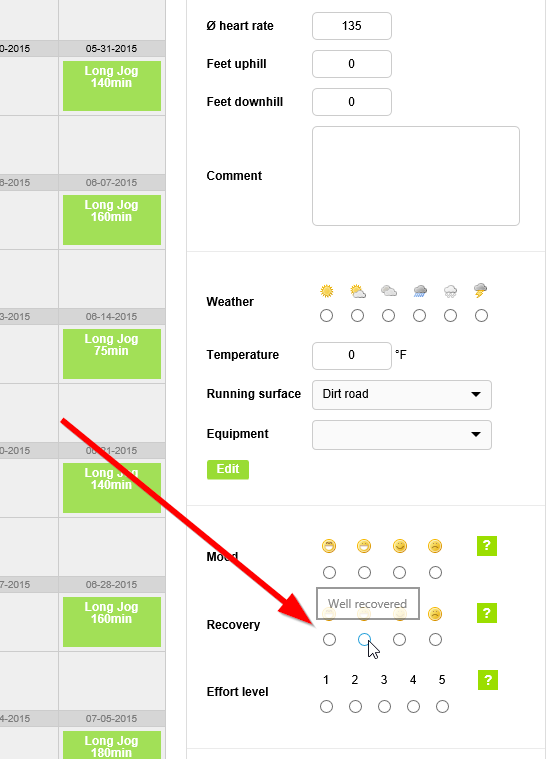 If you do this on a regular basis, you will see that you can manage your training and, even more so, your races very well. We propose an intensity for each training session. By clicking on minus, you can ease every training. running.COACH controls the intensity by adjusting pace and heart rate or the large number that derived from the BORG-factor. Differentiating the training intensity is a crucial factor on the way to an increased performance level. The intensity is the last gear that is rotated in order to optimize the training. First up is the frequency and second period. Proven training form to improve performance. It is characterized by alternating between stress and recovery. However, the relatively short recovery intervals allow only an incomplete recovery because they are designed active. Basically, two variants are differentiated: extensive and intensive interval method. Under the extensive method, the effort is below the lactate threshold whereas under the intensive method it is above the threshold which makes the latter in anaerobic workout. Our immune system protects us from a variety of diseases. Regular, well-dosed aerobic training, good nutrition, and a healthy lifestyle strengthen it. An imbalance of training and recovery, a poor diet, and an unhealthy lifestyle weaken it. Generally speaking, you should only train when you are healthy. Training when you are sick further weakens the body and delays the process of getting well. Moreover, training is really dangerous in viral infections and may damage the heart! When you feel neither healthy nor really sick, an outdoor exercise can often work wonders. In such a case, go for an easy run and try to sleep as much as possible. After a sick leave, you should gently resume training. Take at least 14 days to get back into gear. Either click Minus 1-2 times on each session or set your training target to "fitness" in the settings. Between the effort repetitions of an interval, you do what is called jog recovery. The pace is significantly different from that of the effort and is in the range of regeneration speed. The lactate threshold is a certain intensity level, for example a running pace and provides information about the supply of oxygen to the organism. At resting levels, glucose (grape sugar) is completely broken down to CO2 and water. When exercising, a lack of oxygen is caused and the breakdown is no longer possible. Instead, an increasing level of lactate (lactic acid) accumulates. This is broken down at the same time. When the new production of lactate equals the maximum breakdown speed, one has reached the maximum lactate steady state or the lactate threshold. The long run is a key training on the way to a successful major competition. Basically, the longer this major competition, the more important the number and length of long runs. It is important to mention that our longest long runs do not exceed 3 hours. In our opinion, the additional benefit of longer runs is not in relation to the risk of overloading. 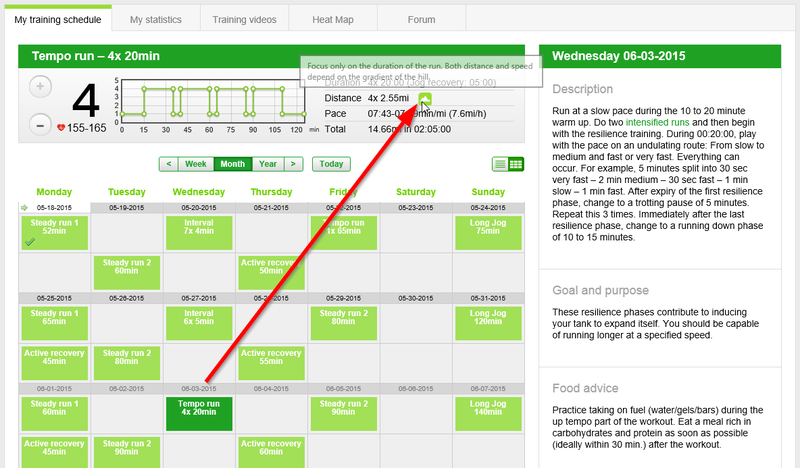 If you think that your long runs are clearly too short, check whether you saved your competitions correctly. - Long run stride: the planned duration is divided into six equal parts. Each part is run at a slightly faster pace - the last part at marathon pace. - Long run with final acceleration: the last sixth of the long run is run at race pace, e.g. the last 24 minutes of a 2-hour long run. - Long run with splits: race pace parts are integrated in the long run. For example, 3 x 10 minutes in 2-hour run. - Intensive long run: a variant "imported" from Kenya. The long run is run at 85-90% of the potential marathon pace. This is a serious workout especially for ambitious runners who want to run the marathon under three hours. The 4-hour runner, however, is in basic endurance zone even at 90% of its marathon pace. This difference results from the fact that the 4-hour runner has to set his marathon speed lower than the top runner. He has to be able to run at his race pace for four hours and not just two hours. If Viktor Röthlin had had to run four hours, he would have had to set a slower race pace, too. Mountain running requires a high level of endurance and strength of the specific muscles. Generally speaking, there are two kinds of mountain runs: one starts down in the valley and ends at the mountain top, the other ends down in the valley and, therefore, adds a loss of altitude. running.COACH offers special mountain running training schedules that are used for the specific preparation. In case of the marathon, for example, this starts 5 months before the race. running.COACH lets you enter two major competitions per semester. The entire training (duration and intensity of training sessions) is geared towards these two events. Open the settings and enter all your competitions under question 4. Useful complementary measure to reduce the muscle tone and thus the risk of injury. We recommend a massage every 3 to 4 weeks. Highest value that tells nothing about a runner’s performance level or his age. What’s crucial is what somebody can accomplish at this heart rate. The maximum heart rate cannot be trained. By training, the maximum heart rate possible can be determined at most. Studies show that the maximum heart rate is subject to large fluctuations. Measurements should, therefore, only be made if you are totally motivated and, even more important, very healthy. Extremely important training session for a successful result in a competition. The medium speed units guarantee aerobic support for various race distances. In addition, the increased performance level can be stabilized and the number of glycogen stores increased. Medium speed efforts come either in a piece or in repetitions. Running makes a good mood on a sustainable basis. However, if you train too much, you risk that the mood shifts. 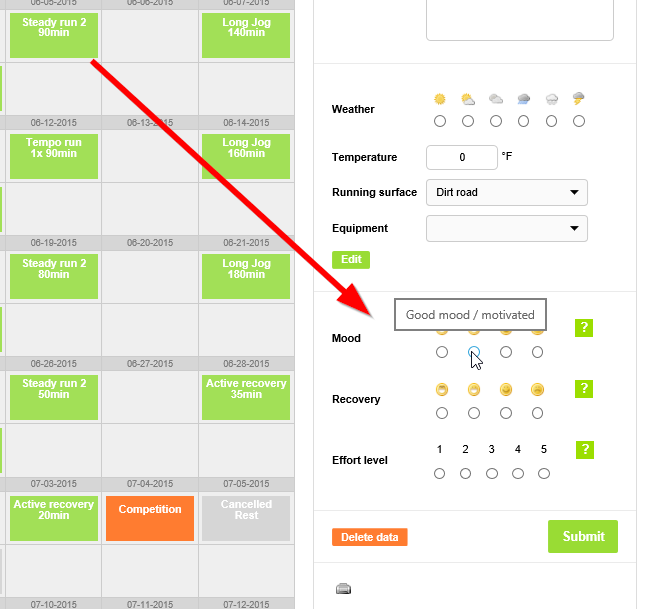 The training diary lets you log your mood. If it is negative for more than 3 training sessions, you should make rest days. Running and our everyday habits lead to functional deficits of the musculoskeletal system. These exercises are designed to help reset the normal basic tension of the muscles and thus prevent injury and to let increase the movement possibilities in our joints. Click here for the exercises. One of the cornerstones on the way to good health and outstanding performances. If you want to be healthy and successful, you have to eat reasonable. The energy from nutrition should come from carbohydrates (50-60 percent), fat (25 percent), and protein (15 percent). Before the training: last easily digestible meal about 3-4 hours before you start running. Additional small snacks at least 1-2 hours before. Before the race: no experiments! Last easily digestible meal about 3-4 hours before you start running. Additional small snacks at least 1-2 hours before (don’t eat too much at a time). Less than 1 hour before the start only carbohydrate gels with enough fluid. Widespread activity that originated in the summer training of cross-country skiers and was later used in the health sector in particular. Done right, Nordic Walking is a full body workout and thus an ideal alternative activity for runners. - 2-3 preliminary competitions spread over the last 8 of the 12 weeks of preparation. - Last competition 7 days before the main competition, maximum 3,000m. - First increase race distances and then reduce them the closer you get to the main competition. For example, 10,000m, 5,000m, 1,500m, 3,000m, and main competition. - 2-4 preliminary competitions spread over the last 10 of the 14 weeks of preparation. - Last competition 7 days before the main competition, maximum 5,000m. - Reduce race distances the closer you get to the main competition, except for the shorter final preliminary competition. For example, 15,000m, 10'000m, 5,000m, 5,000m, and main competition. - 3-4 preliminary competitions spread over the last 12 of the 16 weeks of preparation. - Last competition 14 days before the main competition, maximum 10,000m. - Increase race distances the closer you get to the main competition, except for the shorter final preliminary competition. For example, 5,000m, 10'000m, 15,000m, 10,000m, and main competition. - 3-4 preliminary competitions spread over the last 14 of the 20 weeks of preparation. - Half marathon as “mandatory element” ideally four weeks before the main competition. - Last competition 14 days before the main competition, ideally 10,000m. Key factor on the way to pain-free and fast running. Do our power exercises at least twice a week. You will see that it will not only have a positive impact on your strength itself but also on the recovery. The exercises are usually done using your own body weight and last 45-60 seconds. We recommend not only thinking about running but also adding variety to your training and include the area of relaxation. Qigong is a sensible option we can recommend. It is a Chinese form of meditation, concentration, and movement of cultivating body and mind. Martial arts exercises are part of it, too. It includes breathing exercises, body and movement exercises, concentration exercises, and meditation exercises. The exercises are aimed at the harmonization and regulation of the qi flow in the body. Tension should be followed by relaxation. Try to deliberately give the calming nerve (parasympathetic nervous system) some room for a long lasting balance and a stable health. You don’t feel the same every day. Your muscles, for example, can be fresh, tired, stiff, smooth, or relaxed. Tell us after each training how you felt. This gives you information about your fitness level and your ability to recover. Often underestimated, even despised. But a lot depends from it, in the end both the running success and the freedom from pain. It is, therefore, worthwhile to invest in the running technique and do a technique training on a regular basis. Even if you gain one mere centimeter with every step, it makes a lot in a marathon! - Cool down: slow running after intensive workouts or races starts the recovery. - Stretching: the regulation of muscle tone reduces the risk of injury and conserves an efficient movement amplitude. - Compression Clothing: leads to an improved venous backflow and helps to reduce inflammation. - Ice bath: after the ice shock, the vessels expand again and the blood circulation is increasingly stimulated. - Massage: Loosens stressed muscles. - Autogenous training: regulates muscle tone. Lowest value that is used as basis for our heart rate recommendations. Measuring the rest rate in the morning in bed on a regular basis provides information on how well the recovery has been or whether, for example, a disease is on the way. The general strength is needed to maintain a stable and upright position when running. It is trained with core stability exercises. The specific strength is the leg muscles. They are trained specifically in the gym or they are alternatively stimulated with jumps, hill runs, or mountain runs. Foot gymnastic exercises should be part of the portfolio of each runner. Healthy and strong feet are essential for successful and pain-free training. We offer you the optimal mix depending on your training frequency. Click on the video link on each training day and do the exercise mix. Specific strength training in a gym can be good if you wish to increase training. If you choose this option, you should do that training twice a week (e.g. Mon/Fri). A running-specific strength training lasts 45 minutes maximum. Therefore, you can easily do it after an easy running session. In any case, strength gymnastic exercises are the basis. Strength endurance is the next layer, and the closer you get to the competition the more weight you should add while reducing the number of repetitions. In summary: somebody who runs 2-6 times a week benefits more from an additional running session than from a strength training at the gym. The precondition, however, are regular strength gymnastics trainings. Somebody who trains 7 times or more should seriously think about a specific strength training. If he does it, it should be two sessions per week. - The water improves muscle tone We always tell you how long you have to swim for an equal stimulus. Best regeneration-promoting measure. During sleep, we recover from daily life and training sessions. The more hours and the better the quality of sleep, the more training we can handle. 1. Go for a walk at night. 2. Always go to bed about the same time. 4. Do not eat sumptuous meals before going to bed. 5. Do not eat onerous food (high-fat, legumes). 6. Drink little alcohol at night. It may let you fall asleep easily but robs relaxing deep sleep and awakens you quickly. 7. Make sure the bedroom is well-ventilated. 8. Reduce noise in the bedroom. Worst case, use earplugs. 9. Renounce polluting chemicals in the bedroom (paint, carpet adhesives, wood preservatives, etc.). One of the biggest mistakes of beginners is too large steps. This can cause injuries because much larger forces act on the passive structures when the body’s center of gravity is subjected to high variations. A professional runner adjusts the pace primarily by the frequency and secondarily by the step length. He takes relatively short steps in his "normal" training runs. When he runs fast, he increases the frequency first before increasing the step length. Like the cyclists who leaves the chain on the small disc early in the season and pedals across the countryside at a high cadence. In summer, he throws the chain on the large crank but his legs keep spinning at the same speed and he is taking off. Try to run at 170-180 steps per minute. A metronome will tell you what your frequency is. 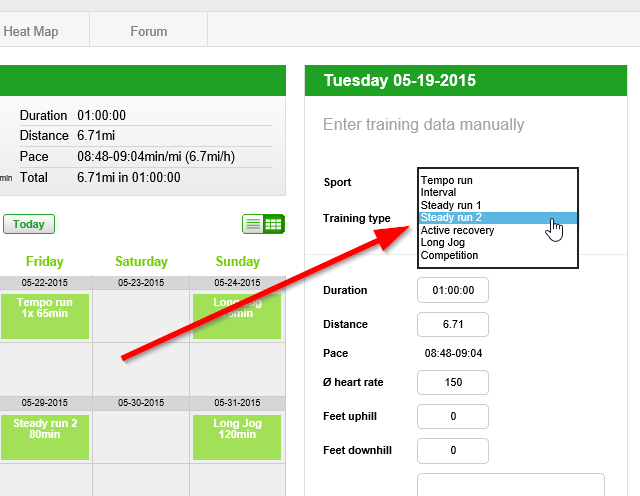 running.COACH allows you to log the training of 10 different sports and get statistical analyses. Currently, it is assumed that a local ischemia (insufficient blood circulation) in the diaphragm is the cause for the characteristic side stitch. The mechanisms are not completely understood, though. What is interesting in this regard is that when we were kids, we already learned not to eat before an endurance training. Today we can explain this advice: food causes the hypoperfusion described because blood is "withdrawn" for digestion. Following an intensive or long workout it is worthwhile to support the recovery with a protein shake. A version of coordination runs. Strides are ideally done after a steady run or long run and immediately before the first interval or medium pace effort. A stride covers the entire speed range over a distance of 80-100 meters: from very slow to very fast. The goals of strides are improving the running technique, making the running motion more efficient, and optimizing the control processes for higher speeds. Stretching helps regulate the muscle tone and prevent muscle shortening. Thus, the risk of injury is reduced and you conserve an efficient amplitude of movement in the joints. Do the exercises after your training, ideally about 4 hours later. Hold the stretch position for 1 minute before switching side or doing the next exercise. Click here for the exercises. The treadmill is a welcome change, especially when outside it is cold, dark, and icy among others. Running on the treadmill comes very close to the natural running motion. In principle, the only difference is that on the treadmill, the rolling carpet pulls the leg back. Outdoors, however, muscle power pulls the body over the standing leg. For this reason, and because there is no air resistance to be overcome, you should set the speed to 15km/h at a 1% slope and 2% at higher speeds. Click here for more info. You can specifically strengthen your thigh muscles, which play an important role in running, with hilly runs and various exercises that we show in the training videos. Make sure you regularly loosen these important muscles to keep them smooth and powerful. Logging is worth the time because at the end of the month you get a sophisticated statistics report and you can analyze your training yourself. The record form is to the right of the calendar. pen. Future training can not be logged. Upload button and complete it with the necessary information. 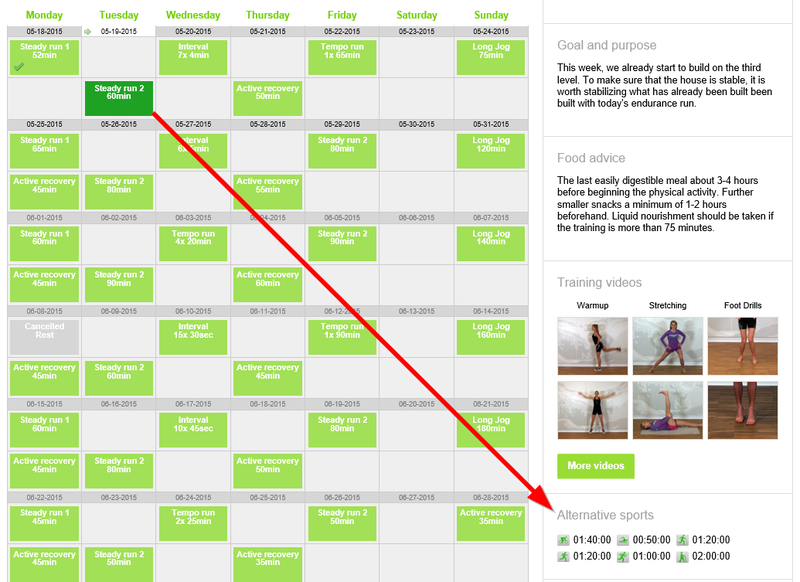 Uploaded but unfinished edited training sessions are showed with a special icon. running.COACH distinguishes and proposes 7 different types of training in a meaningful order. These are recovery, steady run 1, steady run 2, medium pace, interval, long run, and competition. Try to stick to the specified training rhythm because this is a very decisive factor on the way to a healthy and successful development of your performance level. The main gear when it comes to increasing the training. When you want to improve, you must push the training frequency first. Only after that the duration and finally the intensity follow. The training goal also affects the training frequency: the longer the target distance, the more frequently you should train. Target speed is the pace you want to run at in the competition. You have to get to that pace deliberately in workouts on a regular basis so that all systems of the body can get used to it and no unpleasant surprises happen in the race. It is very important that the target speed is realistic and not just a desired speed. You cannot enter a target time because the program automatically calculates a realistic forecast. The advantage of this feature is that in any case, the program tries to lead you to the best possible result and you won’t be overstrained or not challenged enough. Finished trainings can be imported into running.COACH. Thus, logging a training session takes only a few seconds. We currently support Garmin, Polar, Suunto, and TomTom. A warm-up is part of every training session. Do some swing exercises, move all your joints and then get your cardiovascular system moving at a slow pace. This way your blood flows to your active muscles and after about 15 minutes you are ready for a potentially hard workout. Bring some change to your strength training with XCO-Trainer. The training tool is patented because of its uniqueness and successful due to its simplicity. The XCO-Trainer is an anodized (weather resistant) aluminum container filled with a very special granulate. The granulate serves as a loose flywheel. What matters is not the weight of the tool itself but the force applied by the person who uses it. With increasing age, it takes longer to recover from training. This development can be alleviated by getting enough sleep, eating healthy food, consuming little alcohol, training according to a system while at the same time doing the homework. This means that you should do strength exercises, foot gymnastics, and stretching every week.